"Gypsy Boots is made for talking....! ���We will have infomation on Gypsy Boots, The Clown Prince of Health, and his life, his books and movies. Also, upcoming events where you can meet Gypsy and bask in his healthy lifestyle. He wants to get to know all his fans! Good HEALTH to you! GO LAKERS! GO KIRK Douglas! 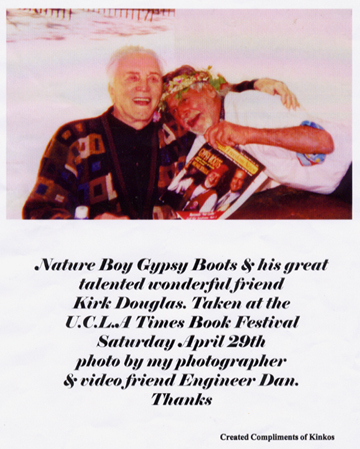 Gypsy recently met with Kirk at the LA BookFair. It was great to visit with his old friend. Nature Boy Gypsy Boots and world traveler and lecturer Charlie Fox appeared at "Rock Peaks Health store in Fallbrook, CA Jerry, the owner has the best tasting, freshest, homemade deli and fresh picked fruits and vegetables you ever had! If you are driving by Fallbrook, CA on I-15 don't miss out on the best tasty Italian food you ever ate at Vinnie's Italian Restaurant on old 395 just off the Route 76 exit. 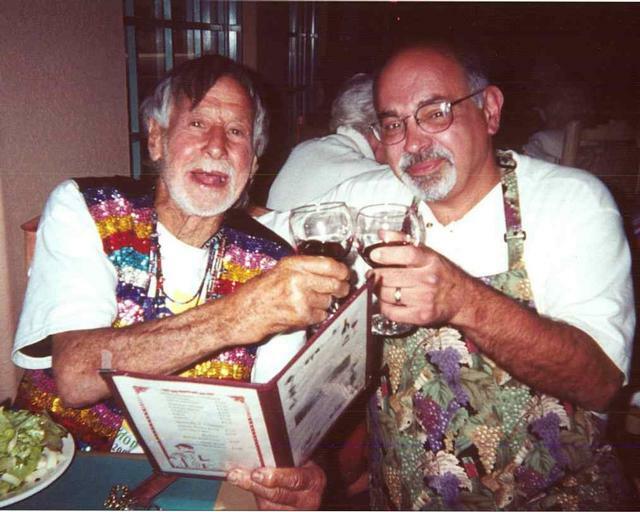 WebMaster Bill loves Italian! The Famous "Glen Ivy Hot Springs" with it's variety of Hot Mineral baths, steambaths, saunas, massages and facial is a favoriate of Gypsy's. Thanks to John Gray and Marie with her variety of body cosmetic products. Gypsy guarantees that after spending an entire day there, you will be more positive and rejunivated. "you'll be born again! ", Gypsy says! Telephone 1-800-454-8772 Plenty of free parking and they have a snackbar with very tasty food. GYPSY has a bit part in Michael Douglas' movie THE GAME having WORLD PREMIER on the WTBS network: Please check your local listings when it will play on TV again! Be sure to look for him in a cafe scene near the end of the movie! Gypsy appeared onstage with Little Richard in a benefit and I hope to have some pictures from the event soon! LOOKING FOR PRODUCERS for MOVIE of GYPSY's LIFE! Gypsy is sooooo happy that this website is finding old friends and new fans from all over the world. PLEASE sign his GUESTBOOK and e-mail the webmaster with your comments! �Daniel Bootzin and Beth Bootzin with his DAD, Nature Boy Gypsy Boots. Dan & Beth are editors & producers of the movie LIFES DRAWING, a light hearted comedy should be playing sometime year 2000. P.S. Gypsy has a cameo part. Daniel Bootzin has a website celebrating his new film, "Life Drawing"
� a light comedy which has recently made headlines at the Berlin Film Festival.� "Look for Gypsy's cameo role! in LIFE/DRAWING"! Visit his son's website! There will be a screening at The Vogue Theater on Hollywood Blvd on June 9th! It was STANDING ROOM ONLY! Look for Mark Ruffalo from "Life's Drawing" on hit TV series "The Beat" on UPN directed by Barry Levinson too! They are the team directors, producers, and writers of the light comedy movie "Life's Drawing" who are now headed to France with their new film after competing in London. "You guys have great talent and Good Luck and best wishes! Greetings go out and best wishes on the upcoming surgury for Miles Hooper, a dear friend of Gypsy's! Gypsy sings,"I'd walk a mile for one of your smiles! And hope to see you at my Birthday Party! Congrats go to Alexander & Marcy Bootzin on the new Baby to make Gypsy a two-time repeat two-time Grandpappy! We have vidcaps of Gypsy's 89th Birthday Party at Paramount!! ...here is a Plans underway for 90th PARTY on August 19, 2000! sneak peak! Videos will be available for sale. Visit with Gypsy each Sunday if you live in LA or Hollywood at the Hollywood Farmer's Market on Vine just south of Hollywood Blvd. Just turn in for Free Parking!. He is their "unofficial Mascot"! Tell him you saw it here! Gyspy Boots wavs! Hear the Gypsy Boots Song! Sound clip from Birthday Party!